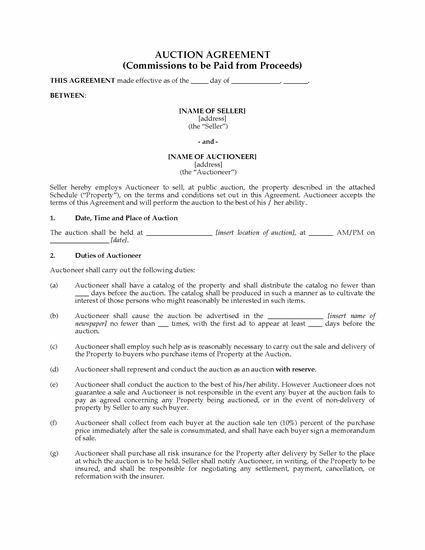 Auctioneers, write up a seller contract for a reserve bid sale with this customizable Auction Agreement for Sale with Reserve. Seller's Costs. The seller will pay for the auction catalog, advertising, delivery of the goods to the auctioneer, and insurance up until the time of delivery. Insurance. Once the goods are in the auctioneer's possession, the auctioneer is responsible for all risk insurance coverage. Promotion. The auctioneer is responsible for distributing the catalog and arranging the advertising for the sale. Compensation. The auctioneer's compensation will be in the form of a buyer's premium on all sales, not to exceed 15%. Scope of Agreement. This contract can be used for general sales of vehicles and household goods, or for auctions of collectibles, antiques, art, and other special items. This Auction Agreement for Sale with Reserve is available in MS Word format. Download and customize for your unique business. All sellers who want to submit items for sale at auction should complete this Auction Consignment Contract and Submission Form. 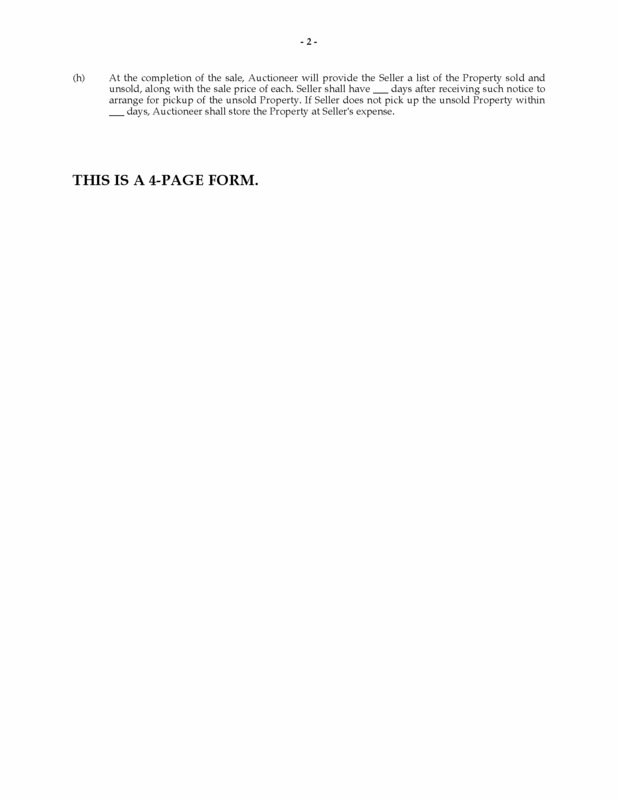 The contract terms and conditions are on one side of the page, and the submission form is on the other side. The form can also be converted to an html page for online auctions. Use this contract for general sales or for sales of collectibles, antiques, art, and other special items. Downloadable and easy to customize so you can add your company info and logo. This Auction Consignment Contract and Submission Form is available as a Microsoft Word template. Prepare a simple Consignment Form with this easy-to-use template. The form is used by one party (consignor) who wants to place goods for sale on consignment with another party (consignee). The consignee will then sell the goods in return for a fixed consignment fee or a percentage of the sale price. The consignee has no liability for loss or damage while the goods are in its possession. 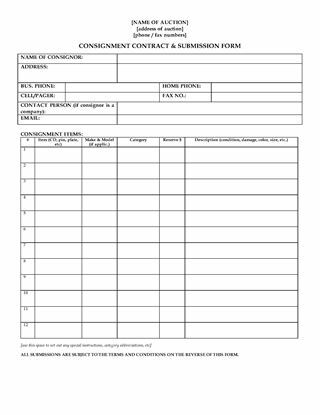 This Consignment Form template is provided in MS Word format, and is easy to download, fill in and print.